The Los Angeles County Metropolitan Transportation Authority (Metro) today announced that it is moving toward a series of public-private partnerships (P3s) that will deliver Measure M transportation projects to L.A. County residents even faster, and more efficiently than expected. The partnerships, which will be created through a competitive bid process, would help accelerate three major Measure M projects: the Sepulveda Transit Corridor, the West Santa Ana Branch Transit Corridor and extension of the ExpressLanes network. This follows an extensive evaluation process by Metro staff on separate unsolicited proposals submitted to the agency. The next step is to issue requests for proposals (RFPs) that give all firms the chance to offer proposals on how these projects could be accelerated. Reaching the RFP stage quickly – something that often takes years – is the result of a new streamlined unsolicited proposal policy that was launched in 2016 by Metro’s Office of Extraordinary Innovation. The goal of the policy is to make it easier for private entities to submit ideas to Metro for building and, in some cases, operating projects. Unsolicited proposals for all three of the projects were submitted within the past year. While the contents of the proposals are confidential, all of the approaches utilize P3 concepts. 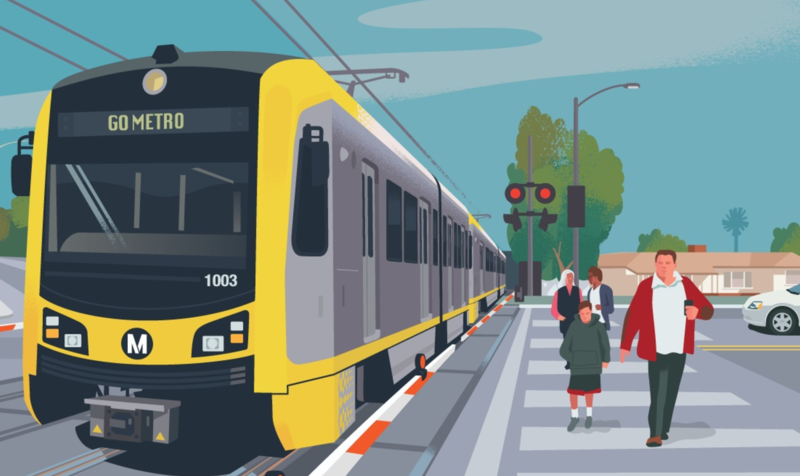 After a detailed evaluation of proposals for the Sepulveda Transit Corridor from Parsons Transportation Group, Inc. and Cintra (Cintra US Services LLC, an affiliate of Cintra Global Ltd.), Metro plans to develop an RFP for the transit portion of the project. The project will be pursued as a Project Development Agreement where the contractor comes on board early in the planning and design process to influence efficiencies and cost savings. Two proposals for the West Santa Ana Branch Transit Corridor from Skanska (Skanska USA Civil West) and Kiewit (Kiewit Infrastructure West Co.) will result in an RFP for a P3 utilizing elements from both proposals. A proposal for providing a regional approach to develop Metro’s ExpressLanes network was submitted by Goldman Sachs. Metro plans to pursue a procurement for bond underwriting to fund the implementation of the regional ExpressLanes network. Metro will now begin developing the procurement process for each of the three projects. Moving forward, Metro anticipates additional opportunities to accelerate other Measure M projects through partnerships with the private sector. Disneyland has openly admitted that, other than physical Park space, transportation to and from the Park is one of their biggest challenges for growth. With the new Star Wars land coming on line in a few years its only going to get worse. While I realize getting OC folks to “buy in” is a reach, we really need to have these conversations with the Disney folks now. In reality, what Disneyland wants, Disneyland gets in Anaheim, so we just need to convince them to want it. While the thought of a rail connection to Disneyland sounds enticing, I doubt Disney is eager to give up the minimum $20 parking fee for each car in the Mickey & Friends garage. While everyone agrees Disneyland loves charging for parking, they have openly admitted that once the park expands, park guest capacity will eventually exceed park vehicle capacity, even with the new parking structure going up. While its not likely to happen in the next 20 years, its important for Disney to design its future infrastructure in a way that would not prohibit building the station at some point in the future (i.e. leave enough open space in design of the new Easter Gateway Transportation center to allow for the construction of the subway station). Star Wars land is just the beginning. Its been understood by Anaheim business owners for some time that Disneyland has been quietly purchasing properties that surround the park for years under various legal entities not name Disneyland. All these purchases were probably made to move its support infrastructure out so they can expand the guest used portions of the park. I applaud its growth and hopefully can avoid parking there by taking the train one day. I like this idea. You can even have special trains designed by Disney that can take passengers from Union Station to the park to enhance the experience (and charge more for). The “Disney Experience” train, so to speak. Umm, based on Google Maps, that ROW does not actually go into the property. I’m not sure how the residents around those houses would think about passenger service around there either. But I don’t disagree with you completely. I think Metrolink service (Speeds of 80 to 90MPH) is better for serving that ROW as it would also provide service to Vernon, South Gate, Downey, and Norwalk in LA, and Buena Park – Downtown/Knotts Berry Farm are both about 1 mile away from Beach/I-5 where the ROW is), Disneyland, Stanton (Connections to Santa Ana Line), Garden Grove, Cypress (via Spur), Westminster and North Huntington Beach in Orange County. All this directly from Union Station by the way, which would still provide faster service to both Buena Park and Disneyland faster than a light rail line going at 55 MPH through Belflower and Artesia before finally going to Disneyland and skipping Knotts. As to why this ROW hasn’t been considered by SCRRA is beyond me as even though this would theoretically be the shortest route in the system, I can definitely see ridership potential along such a commuter line. But I’m hoping to see this ROW on the list for passenger service, along with a Rail Line from Downtown to North Hollywood (via Glendale and Burbank) in my lifetime. @Al Theres no such thang as “the Pond”………. It depends on how you define the word “directly.” The right of way I mentioned does run directly to the Park property (if you shrink google maps you can see the northern portion of CA Adventure is built over the right or way, then the right of way continues east to the new Transportation center). The point is the right of way is there, connects to the WSAB, and allows for short tunnel section to be built connecting Disneyland via a below grade station at the new Transportation center. With regards to Metrolink vs light rail, I don’t have any skin in that game, whatever is the most cost effective should be utilized. As s note on speed, I’ve been on the 105 fwy doing 70 mph with the Green line train right next to not falling behind, so to say light rail is automatically going to be slower then Metrolink may not be true in all cases. What will really dictates the speed is how they design the line (grade separations and station designs). I will say the way they are planning to move this line through the south gate, Huntington Park neighborhoods, possibly inter-line it with the Blue line, and the proposed at grade terminus station ON Alameda in front of Union Station makes me think its going to be light rail for sure but your guess is as good as mine. All this assumes buy-in from notoriously anti-Transit Orange County. Metro is having a hard enough time getting SANBAG to commit to Montclair — good luck with those behind the orange curtain. No option for Crenshaw Northern Extension. Connecting the line to LAX to the Purple and Red lines seems like it would have good ridership and be really useful for the Olympics. It doesn’t seem that the route for the Crenshaw North portion is anywhere near to be chosen. For projects with the most impact, Crenshaw North, Sepulveda and WSAB rate much higher than Gold to Montclair or the downtown streetcar. Bag the Express Lanes. I’m NOT paying monthly for a transponder to ride with more than one person “FOR FREE.” It’s NOT free — you HAVE to pay for a transponder!!! Which means I can’t use the carpool lanes…even thought I’M CARPOOLING!!! Idiocy. That’s exactly my problem with this whole ExpressLanes idea. I don’t mind congestion price, but let’s face it, Orange County and Even San Diego have 1-up us on this one. Correct me if I’m wrong but in San Diego County Carpoolers don’t actually need the transponder to use the ExpressLanes?? Dude, the monthly charge is $1. How little is your time worth that $1 a month is stopping you? Wait. So 1003 is the mascot car, not 1001? Also, what’s with the P3010s pairing with P2000s on the Green Line? I just witnessed a legend as a P3010 was the lead car. Run the Monorail to the Anaheim Amtrak station at Anaheim Stadium, to the Convention Center, to Disneyland and on to Knott’s Berry Farm. That will resolve a lot of transportation issues. Love the idea, but the city of Anaheim recently killed the streetcar proposal, so I doubt they’d help fund anything more substantial. The LA Times did a series this week on the backlash in Anaheim over special treatment for Disney.